Just in case you're still deciding what to make for the Big Game tomorrow, I thought I'd toss out some easy favorite recipes that are always crowd pleasers. Go eat! Oops, I mean Go team! © Copyright 2010 FarmgirlFare.com, the TV-less foodie farm blog where I've never been much of a football fan (except for going to Bears games back when I was at UC Berkeley), but I'll use any excuse to feast on some good party food. Wonderful recipe line-up! Thank you! I love your recipes so delicious! Enjoy the Superbowl! After inspiring me with your recipes earlier I went away and made your Banana Chocolate & Cinnamon Mexican Monkey cake mmmmmmm it's so good!!!!! Georgous & ooh so tasty multiple recipes!! What to choose to make??? I've tried both your white bean dip and the baby shortbread bites - both absolutely delicious! I just baked shortbread bites last weekend - and saved half in the freezer for later. You were so right that they freeze wonderfully! I'm going to have to try those scones and the apple blueberry crumble bars next. They look fantastic! Have you ever tried freezing the scones of the crumble bars for later? I'm so glad you're having delicious success with my recipes. As far as freezing goes, I toss pretty much all my baked goods in the freezer, including scones and the blueberry crumble bars. It's so handy to have them on hand, and they both freeze beautifully. I either cut up the bars and wrap them individually in plastic, then put them all in a freezer zipper bag, or sometimes I simply put the entire baking pan in the freezer (I have some with snap-on lids, which are so handy). 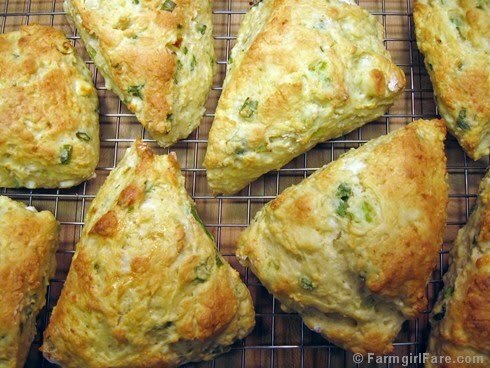 The scones are simply tossed in a freezer zipper bag. OMG, I made the Swiss Chard pizza last night. Delish!! I used olives instead of artichokes b/c that's what I had. Even my husband who's getting tired of Swiss Chard and Kale loved it. The 2 of us ate the entire pizza! I'd be feeling virtuous except for the cheese!